Tag line: "He's the best there is! (Actually, he's the only one there is.)" The opening scene of 1994’s Ace Ventura: Pet Detective tells you everything you need to know about this movie. In it, the title character, posing as a delivery man, is shaking, dropping, kicking, and otherwise mishandling a package clearly marked “Fragile” (with each step he takes, you hear the broken glass rattling around inside it). It’s a familiar joke, done before in a number of screen comedies, yet star Jim Carrey’s exaggerated mannerisms (from his bizarre walk to the way he contorts his face) brings a fresh energy to it. Without Carrey, this would have been a tired old routine. With him, it’s pretty damn funny. Carrey is Ace Ventura, a private detective who specializes in finding lost or stolen animals (“I don’t do people”, he says at one point). His approach to his job is… shall we say… unusual, and over time he’s managed to piss off the entire Miami police force, especially Lt. Lois Einhorn (Sean Young), who’s barred him from the station. Still, Ventura’s skills make him the perfect person to investigate the recent kidnapping of Snowflake the dolphin, the mascot for the Miami Dolphins football team, which is days away from playing in the Super Bowl. Hired by the team’s chief publicist, Melissa Robinson (Courtney Cox), Ventura discovers that the kidnapper was most likely a former player, one who was part of the team that won the AFC Championship in 1984, only to lose the Super Bowl by a single point when kicker Ray Finkle blew a last-second field goal. The case intensifies when Miami’s star quarterback, Dan Marino (playing himself), is also kidnapped right before the big game. Are the Dolphins destined to lose yet another Super Bowl, or will Ace Ventura save the day? Story-wise, there’s not a lot to Ace Ventura: Pet Detective, and the supporting cast is woefully underdeveloped; Courtney Cox’s character, Melissa Robinson, is reduced to a sidekick / love interest, standing in the background of practically every scene. And while I thought rapper Tone Lōc was an interesting choice to play Emelio, Ace’s only friend on the force, he’s given absolutely nothing to do. In fact, Sean Young's belligerent police Lieutenant is the sole supporting character given a few memorable scenes of her own. But then, Ace Ventura: Pet Detective is, and was always intended to be, a showcase for Jim Carrey's unique brand of comedy, and it’s his strange behavior throughout that gives the film its vitality. 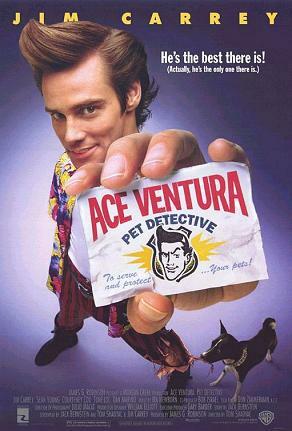 After rising to stardom as part of the cast of In Living Color, a TV sketch comedy (a la Saturday Night Live) that was a hit for the Fox Network in the early ‘90s, Ace Ventura: Pet Detective marked Carrey’s first lead role in a motion picture, and he did his best to make it an unforgettable one. In what might be the film’s funniest sequence, Ventura poses as a crazy person (in a tutu) in order to infiltrate a mental hospital, which houses information that's vital to the case (the scene where he meets the facility’s director, played by David Margulies, reveals just how talented a physical comedian Carrey can be). Even moments that seem entirely out of place are a source of laughter; while checking out the empty tank that housed Snowflake the dolphin, Carrey imitates several Star Trek characters (his Captain Kirk is spot-on), at times getting as close to the camera as he possibly can. These impersonations don’t really belong in the movie, and are nothing more than Jim Carrey showing off, but they’re hilarious all the same. Carrey would go on to make better films (The Truman Show, Eternal Sunshine of the Spotless Mind) and better comedies (Dumb and Dumber, The Cable Guy), but if you're looking for some mindless fun, Ace Ventura: Pet Detective is a sure bet.